Wash strawberries thoroughly and cut off stems. 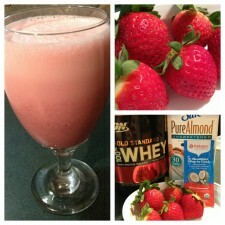 Place strawberries, protein powder, coconut oil, almond milk, and ice in a blender or Magic Bullet. Blend together until completely combined. Not only is this protein shake a wonderful way start to your morning, but is also great pre or post workout! Make sure to check out my Top 5 Uses for Coconut Oil and Working Out for more tips. If you’re looking for a sweeter way to use strawberries, my recipe for lemon cake is perfect! If you’re around the Orlando area, make sure to stop by the Europa Fitness Expo April 19th-20th and visit our booth! This is great! I just LUV anything, everything coconut! Thanks for all the great recipes :). I cannot wait to try all of them. Does coconut oil go bad soon if I don’t put it in the fridge? No, you do not need to refrigerate coconut oil! What is your favorite recipe?